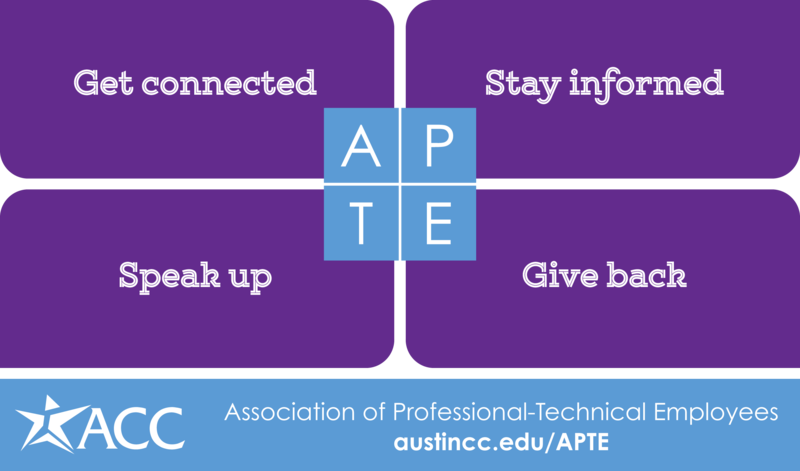 The Association of Professional-Technical Employees (APTE) is an employee association based on the college’s personnel classification system. You become part of the Association when you are hired as a professional/technical employee. The employee associations, —Full-Time Faculty Senate, Adjunct Faculty Association, Classified Employee Association and APTE—participate in the College’s Shared Governance process, a collaborative process by which councils and committees review the college’s processes and procedures and make recommendations for policy that are based on the mission, goals, and values of the college. The APTE has several goals. Over the years, we will work to identify ways in which our members have a positive impact on student learning and engagement, as well as areas in which we face challenges, where we could provide better services to our students. As ACC continues to grow, APTE’s dedicated and talented employees are ready to further the Student Success Initiative, learning from and celebrating our successes and improving our systems to meet the growth and change. Every month the APTE’s President provides an update of APTE activities to the college’s Board of Trustees, and wants to include success stories from our members. Tell us the part that you play (big and small) in student success so we can highlight what we do for the board, please fill out and submit this Success Stories form. Additionally, we want to bring forward any suggestions our members have for improving the college’s systems and policies. Many of the changes around the college have started through the employee associations, councils and committees, including amendments to the college’s leave policy, which started through APTE. Please fill out and submit the Ideas form so that the APTE President may also address the Board with these ideas for improvement. Get ready for some positive change this year, and help us lay the groundwork for a great future at ACC! APTE is one of four internal employee associations. The four associations include the Full-Time Faculty Senate, Adjunct Faculty Association, APTE and the Classified Employees Association. The internal employee associations are based on the College’s personnel classification system. Association membership is open to all employees in the relevant category at no cost. The administration encourages internal employee associations to actively participate with the administration in the development of Board Policies, Administrative Rules and Procedures, and to advise and consult with the administration on actions that have a substantial effect on their members. Internal employee associations are part of the College’s Shared Governance process. Shared Governance is a collaborative process by which trustees, administrators, faculty, staff and students work as a community of colleagues to advance the mission, goals, and values of the college. Shared Governance requires open communication among stakeholders in an environment of mutual respect, collegiality, and accountability.